The 8 auspicious symbols are popular choices for good luck emblems to use in feng shui applications. 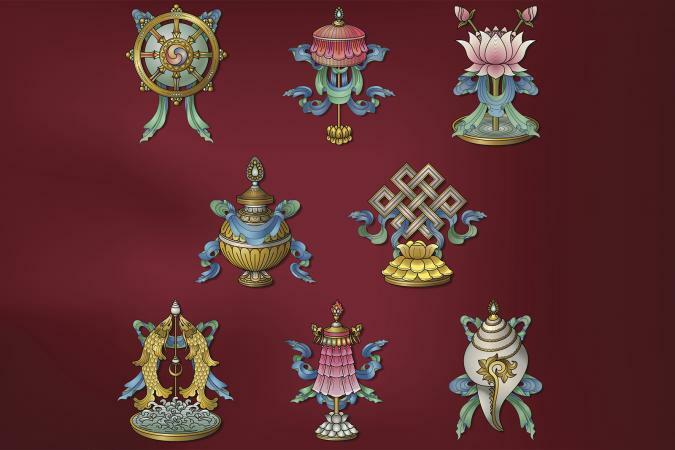 The Eight Mahayana Buddhist symbols are considered bringers of good fortune by the faithful. They adorn most temples and monasteries in Tibet. The symbols draw positive energies of prosperity and harmony into a feng shui design. You can use the auspicious symbols individually or as a group. Assess the meaning of each symbol and then decide the best sector to place it. The banner of victory is believed to represent battle banners; however, one legend claims Buddha set a banner on the Mt. Meru summit as a symbol of his victory over the universe. It became a symbol of Buddha's enlightenment over ignorance. The banner resembles stacked parasols. Thirteen umbrellas stacked on top of each other are a popular choice for feng shui use since they represent royalty. Set a banner behind your desk or on the north wall of your office to ensure victory over competition and in career challenges. Overcome life challenges by placing a banner in the center of your home. If combating an illness, place the banner in the east sector of your home. The white conch shell is a cherished symbol and like many ancient symbols, it holds several meanings. In ancient times, it was used as a horn trumpet and warriors wore the shell as an amulet. The shell was believed to have magical properties and was revered as a symbol of power. The right-turning conch shell is considered sacred and used in religious Tibetan ceremonies. This shell also represents the movement of celestial bodies. Use a conch shell to attract education luck by placing in the northeast sector (education sector) or the northeast corner of a den/living room. Set a conch shell on the northeast desk corner. 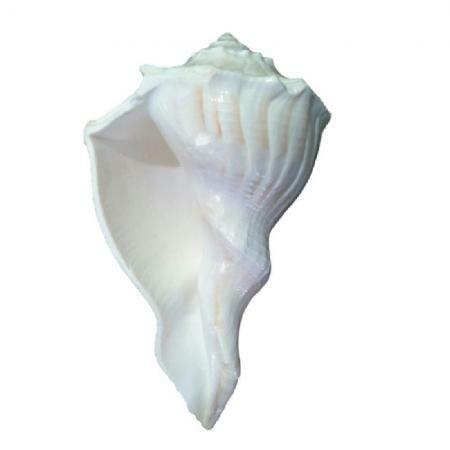 Place a conch shell in the southwest corner of a bedroom or the southwest sector of your home to ensure a happy marriage. Create harmony in your family by setting a conch shell in the west sector (descendent's luck) or west corner in the kitchen. 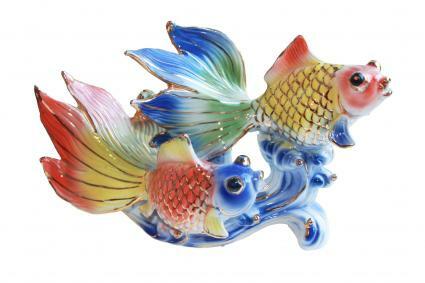 The pair of golden fish, koi (carp), represents abundance and wealth. It can also be used as a fertility symbol since carp procreate very rapidly. Pairs used in feng shui are considered very auspicious symbols for marriage. Traditionally, a pair of koi represents the sexual unity and fidelity of a married couple and are often given as a wedding gift. The southwest sector of the home governs marriage or love relationships and is an ideal location for a pair of golden carp. Place a figurine or painting of two golden carp in the southwest corner of the master bedroom, but avoid depictions of water. As a symbol of wealth and abundance, use the double golden fish in any afflicted sector or sector you wish enhanced, such as southeast (wealth) or north (career). The golden wheel is an ancient Indian symbol. 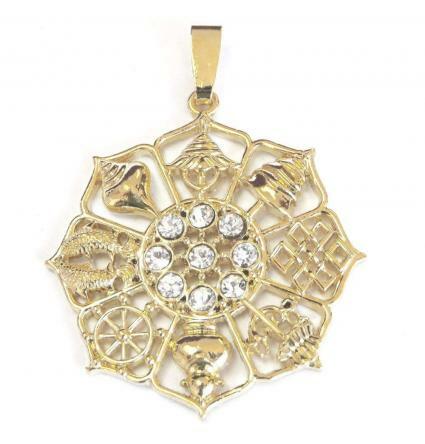 It has represented the sun, creation, the Sudarshana Chakra (Krishna's divine discus weapon) and even the Buddha's teachings with the eight spokes symbolizing the Noble Eightfold Path. Sudarshana means auspicious vision. 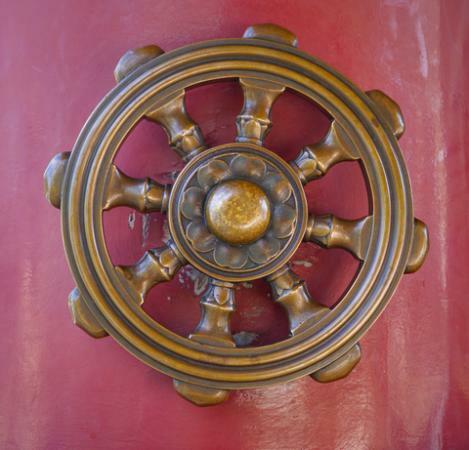 The wheel is often referred to as the ship's steering wheel or the Dharmachakra Wheel of Fortune. The spokes represent the eight compass directions, and the golden wheel is supposed to attract all the auspicious energies from each of these directions. It is a symbol of protection and great power that defeats and neutralizes all negative forces. Set the Golden Wheel in the center of your home to ensure the auspicious chi from all directions are attracted into your home. Negate bad luck by placing the golden wheel in one of your four auspicious directions based on your kua number. Use in any afflicted sector, especially those affected by negative flying stars to neutralize those inauspicious energies. The lotus flower is a symbol of purity and enlightenment that offers protection and other auspicious benefits when used in feng shui applications. The lotus is a very powerful cure for disharmony and illnesses. Place the flower in the east sector that governs health luck. 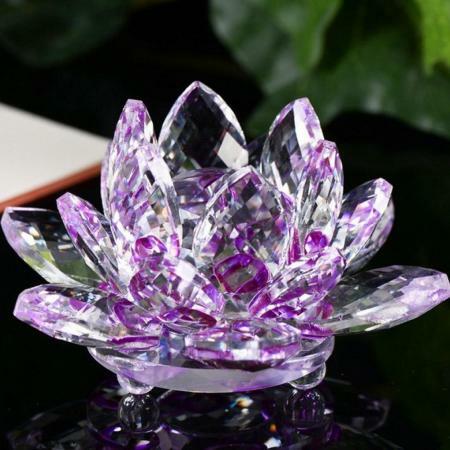 Set the lotus flower in the center of your home to ensure harmony. The mystic knot consists of six infinity knots. This is a symbol of good fortune and longevity. It brings never-ending abundance and prosperity. 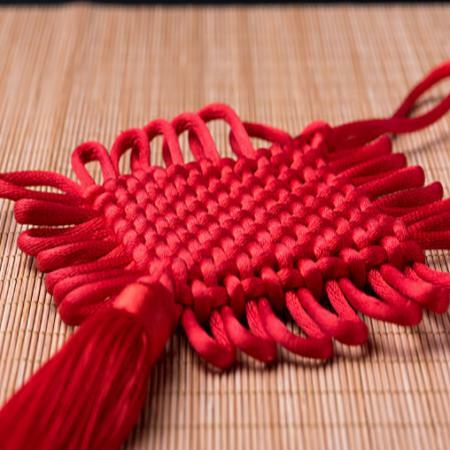 It brings auspicious chi to all areas of your life and offers protection. When paired with other feng shui symbols, the mystic knot gives a boost to those positive energies. Use the mystic knot to counter inauspicious flying stars. Paired with Chinese coins, the mystic knot will increase wealth when placed in the southeast sector (wealth luck). Pair with a symbol of a happy marriage, such as a pair of mandarin ducks to give your marriage protection and to ensure happiness. The treasure vase is the ultimate wealth cure in feng shui. This long-kept secret of the royals is also known as a money vase or wealth vase. 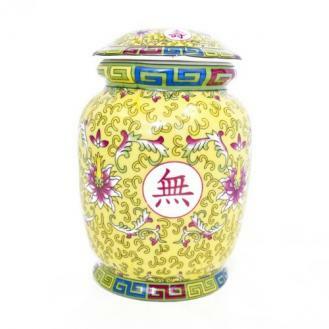 The vase is filled with all types of actual treasures and symbols of them, such as gold ingots and Chinese coins. The lid is then covered with colored fabric and tied with ribbons. Store it in a cherished space that is above the floor, such as in a locked cabinet. The vase should never be disturbed or opened once it's placed. The southeast sector is the ideal place for your vase. Don't store in the kitchen or bathroom. The white parasol or umbrella is a goddess that legends claims came out of Buddha's forehead. She is also called the "Goddess of Victorious Parasol" or the "Goddess of the Glorious White Umbrella." She has a thousand eyes and a thousand arms that enable her to be all powerful and protective. She protects against disease, obstacles, and any of life's challenges. Her white parasol symbolizes that powerful protection. Believers call upon her to protect against black magic, diseases, natural disaster, and any other threat or challenge as well as to grant wishes. 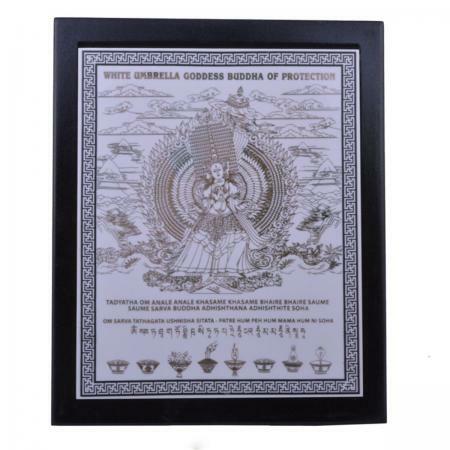 Place a plaque of the white umbrella goddess on the sector wall or table/desk. Receive the goddess's blessings for good fortune, success, and happiness by setting a replica in any sector you require assistance. Use a white parasol to receive recognition in your career. The eight auspicious symbols can also be used in groups. These good luck and good fortune symbols are often worn or displayed in homes, offices, and businesses. Depending on the culture, the objects are often used to represent the Buddha. In Buddhism, the eight auspicious symbols represent different parts of the Buddha's body. For example, the conch represents the gallbladder while the double golden fish represent the kidneys. The symbols can be used for protection against home invasions, thefts, and robberies when placed at the main entrance, facing the door as though looking out through the doorway. Set symbols at main entrance to ward off accidents. Wear an object that combines all eight symbols for protection against illnesses, accidents, and other life-threatening events. The symbols can counter inauspicious flying stars. The inauspicious energy generated by a front or main door that opens opposite a garage, staircase, or window can be negated by these eight symbols. A general location for the eight symbols is the center of your home. This placement will generate good luck and fortune for all household members during the Period 8 Cycle (2004-2024) as dictated by the flying star map. It is believed that during the Period 8 Cycle, the symbols are most powerful and most auspicious. Feng shui practitioners often recommend this grouping when other feng shui symbols or cures are deemed inadequate to serve as a potent enough cure. This is especially true for severe inauspicious issues. Use the symbols in areas you need a good luck boost or feng shui cure, such as southeast for wealth luck, south for fame luck, north for career luck and other luck sectors. Place the combined object or individual objects in a grouping on your desk or other work station to boost your work-related luck. Eight Auspicious Objects Combination: This is one object comprised of all eight auspicious symbols. 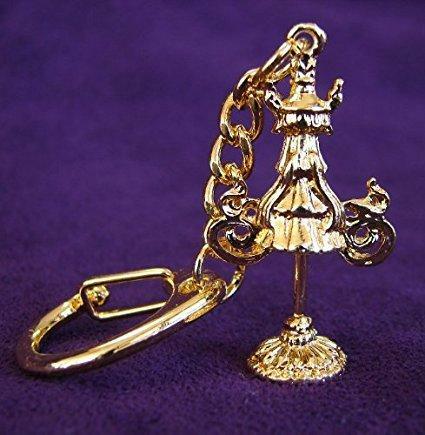 The object is made of brass and gold-plated, standing less than 4 inches high. Price: Around $44. Golden 8 Auspicious Objects Set: Individual objects are grouped together as a set. Each object is made of brass and gold-plated and enamelled. These are small objects, with measurements under 3 inches in all directions, making them easy to place as a group. Price: Around $60. Eight Auspicious Symbols Plaque: Wood plaque features the complete set of eight symbols. You can hang this 9-by-7 inch plaque on the wall or place on a stand (use on a desk, table or shelf). Price: Around $80. The eight auspicious symbols used in feng shui will attract the best chi energies into your life. It's not enough to add these symbols into your decor. You should know what each one is and be mindful of the work each one does to improve all areas of your life.